Trey is going to be around eight feet tall, outstripping Vlad's current record holding status. 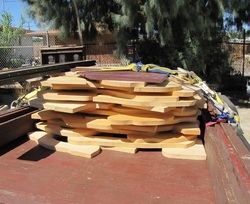 We are hoping to reduce his weight to about 600 pounds (versus Vlad's 1200) by using Italian Poplar plywood for his construction, which is significantly lighter than standard plywood. Trey in his early cutout stage. 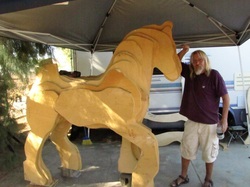 Lester, the Rockinghorse guy, carrying raw plywood for Trey. Trey, standing on his own four feet! 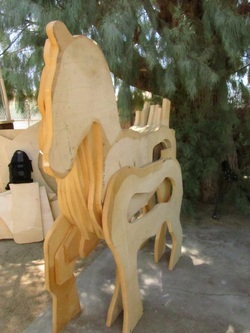 Trey, like all the rocking horses, started his life as a stack of wood. In this case, he is Italian poplar, a lightweight wood known for its strength and beauty. Here, Trey is starting to assume his rough shape. Initial assembly is done with him lying on his side, and then he is raised and assembly continues until he is finally standing on his own four feet. 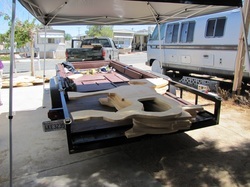 Each foot is at a slightly different level, and that will be addressed in final construction when his rockers are made. Until then, he has creative blocking permitting him to stand for carving. Trey with Wallop, one of our former pushmonkies. Wallop helped with the initial assembly and "barnraising". Lester and Katlinel will complete the carving together. 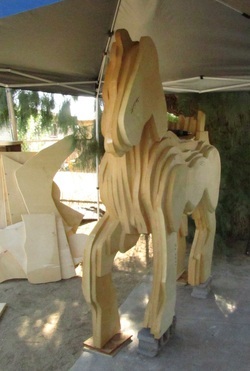 Each rockinghorse is a labor of love, and each one reveals its own unique personality as the carving progresses.